Firefighters responding to a call on the Golan Heights were shot at by 'someone' on the Syrian side of the border. Israeli firefighters responding to a call on the Golan Heights Sunday morning were fired upon by forces on the other side of the Syrian border. No one was injured. IDF soldiers removed the firefighters safely. The army has not yet responded to the fire. The incident occurred in the area of Ein Zivan, a kibbutz in the lower Golan Heights near the Syrian border. Firefighters were responding to a call to put out a small brush fire. As the firefighters were working to put out the fire, gunshots were fired in their direction from the Syrian side of the border. Firefighters took cover, and IDF troops immediately arrived to evacuate them. The firefighters were able to successfully douse the blaze before they were evacuated. The incident was just the latest in a long series in which fire from the Syrian side of the border “leaked” into Israel as fighting between Syrian rebel fighters and the Syrian army continued in the context of the ongoing civil war on the country. Last week, a 15 year old boy was killed when fire from Syria were fired into Israel. In a statement, IDF said foreign press spokesman Lieutenant Colonel Peter Lerner said that the shooting was “an intentional attack, not errant fire. "This is the most substantial incident on the border with Syria since the beginning of the civil war,” he added. The IDF responded to the attack, firing on the border town of Quneitra, which is in Syrian President Bashar Assad's control. The Syrian border with Israel has in recent months been less than quiet, with small skirmishes erupting between Syrian rebel forces and the IDF on several occasions. Earlier this month, Syrian rebels shot at an IDF post near Mount Hermon; no one was hurt. 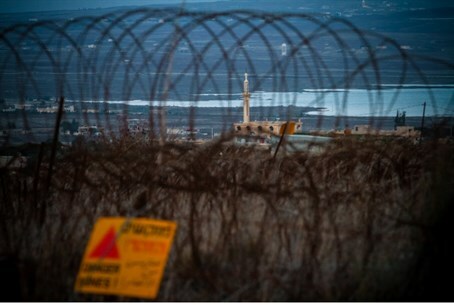 In early March, two rockets landed also near an IDF post in Mount Hermon. No injuries or damage were reported in that incident. Despite several incidents, Israel has rarely seen damage or injuries from the threat of Syrian fighting along the border. Last month, several top military officials warned that the war would inevitably cross into Israel, however - and that when it did, Assad would pay the price. "It happens quite a lot, almost daily, that a Syrian plane fighting with rebel forces approaches the Golan Heights border" an official said in May. "When it does happen, [Assad] will fall. It's bound to happen."